Michigan voters will spend next Tuesday wondering who will win the state’s presidential primaries. Elections officials will spend that same day wondering if the state’s voting machines will make it through one more election. Michigan’s voting machines are outdated and beginning to break down, with counties buying used parts on the Internet and nursing a computer operating system that stopped being sold in 2008. Voting machine problems at the polls could lengthen the already long time it takes many Michigan voters to cast ballots – Michigan already ranks 46th in that category. Funding to start replacing machines may be on the way soon, if an appropriation in Gov. Rick Snyder’s proposed budget is approved by the Legislature. But it’s not a sure thing – a similar funding request for new voting machines was cut from the state budget last year. It’s already too late to get new voting machines for the presidential election in November. It’s hoped that if funding is approved, voters will have updated voting machines in time for the 2018 elections, when Michigan will elect a new governor. Michigan’s optical scan voting machines are between 10 and 12 years old, according to a state Senate Fiscal Agency report in Fall 2015. Michigan’s not alone. Our voting machines, along with many around the nation, were purchased with the help of federal funds made available to states after the controversy surrounding vote counting in the 2000 presidential election in Florida, in which the world learned about hanging chads. Those voting machines are now outdated and breaking down, according to a study by the Brennan Center for Justice at the New York University Law School. New machines typically cost about $2,500 to $3,000 apiece, according to a report released this week by the Pew Charitable Trust. And a 2014 presidential commission on voting administration warned of an impending crisis if voting machines are not updated. “We’re running into issues with memory cards and some motherboards,” said Oakland County Director of Elections Joe Rozell. Some parts are still available from the manufacturer, but for other replacement parts needed to keep the system running, Rozell has had to search for the Internet for used components. Like the rest of the state, Oakland County’s voting system runs on Windows XP – an operating system that hasn’t been available for purchase since 2008. The operating system is so old, Windows stopped servicing it in 2014. Because the voting system runs on Windows XP, voting results can’t be loaded onto computers with newer operating systems such as Windows 7, 8 or 10. In Ingham County, workers at some precincts must drive the results to the courthouse in Mason, with the results on what county clerk Byrum describes as an “8-track tape” that plugs into one old machine. “When it starts up to run, it sounds like a freight train running into the courthouse,” Byrum said. Byrum and Brown, who both were legislators before becoming county clerks, said they are confident the system will accurately count votes on Tuesday. But if voting tabulators break down March 8, or in the August state primary, or the November general election, voters may have to stand in line longer to cast their ballots. Michigan already ranks 46th in the nation in the length of time it takes the average voter to cast a ballot, according to an MIT study. On average, Michigan voters waited 21.9 minutes to vote in the 2012 election. The national average was 14 minutes. Florida voters waited the longest (45 minutes), and Vermont voters the shortest (2 minutes). And across the state many clerks have expressed concern that the legislature’s recent decision to eliminate straight-ticket voting, a measure signed by Gov. Rick Snyder in January, will extend wait times even further. The state is scheduled to receive bids on new voting machines in March. The Senate Fiscal Agency estimated the cost to replace the state’s voting machines could be around $60 million. 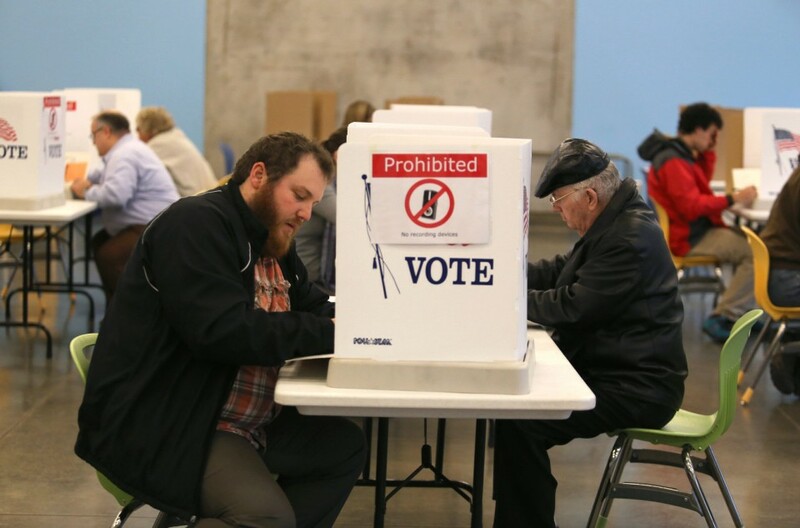 Michigan still has about $25 million in federal funds given to the state to update election equipment through the Help America Vote Act a decade ago, significantly decreasing the state’s share of the tab. The Legislature appropriated $5 million for voting machine replacement in December. The money was added to the bill banning straight-ticket voting to assure that voters could not overturn the ban. (The Michigan Supreme Court has ruled that ballot issues cannot overturn laws that include an appropriation). Michigan voter had overturned a previous ban on straight-ticket voting. Snyder’s proposed budget includes an additional $10 million for voting machine replacement. Ingham County Clerk Byrum said it’s time for the state to write a check for new voting machines, before disaster strikes. Wait a minute the legislature put funding for machines into one of the bills that they didn't want us to overturn with a referendum vote. SO WHERES THE MONEY? Where is the $5 million? There is a simple and cost effective solution to this crisis. PAPER BALLOTS, HAND COUNTED IN FULL VIEW OF THE PUBLIC. http://www.truth-out.org/opinion/item/11459-what-voting-can-look-like Nothing like a paper trail to keep everyone honest. And it encourages citizen participation, improves trust in the process, and puts money back into the community rather than sending it off to voting machine makers who keep the source code a secret. The source code is not a secret. It goes through a very expensive certification process on both the federal and state level. When do you want your results from the election? The next week? You might want to go watch the process that happens after the polls close. Accounting for each ballot used that day, spoiled or countable. If we get new machines, there should be paper ballots that can be counted to verify potential discrepancies. I have seen several articles on the potential that voting machines were hacked and votes flipped from one candidate to another. With a paper ballot my vote is protected, because the ballots can be recounted by hand. Yet another infrastructure issue like roads, bridges, water systems, electric grids, etc. The GOP doesn't believe in government, infrastructure, taxes so they just ignore things until they can't anymore. Then they blame someone else, deny and then do nothing. Michigan needs to move forward and encourage voting both by mail and online. If I can safely buy anything online, I should be able to safely vote. UPDATE.... Voters being turned away in many districts due to voting machines being down.